More than 100 businesses will be on hand for the Wright State Career Fair, which is open to students and alumni in the Student Union on Sept. 16. Employment is just over the horizon for students. On Tuesday, Sept. 16, from 9 a.m. to 1 p.m., students and alumni interested in co-ops, internships and career positions are encouraged to attend Wright State University’s largest Career Fair to date. There will be 112 companies and businesses throughout the Student Union looking to hire anyone that meets the mark. From Gentex Corporation, Enterprise Rent-A-Car and the Wright-Patterson Air Force Base AF Life Cycle Management Center, to the Peace Corps, Office of the Ohio Attorney General, Dayton Children’s Hospital and many more, employers of all kinds will be in attendance at the Career Fair. The Career Fair is open to students and alumni of all majors and career pursuits. In years past, Career Services hosted more focused Recruitment Days, where each day would be devoted to a specific field. Joseph Slater, Ph.D., interim associate vice president for career and workforce development, said the switch to a more global focus works out in everyone’s favor. But as always, students and alumni planning to attend are encouraged to dress for success and to arrive with résumés in hand. Walker considers herself to be a career coach. 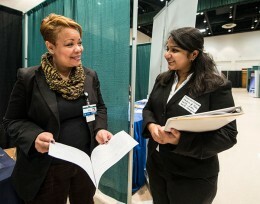 By interacting with potential employers and marketing oneself, Walker says the Career Fair is an opportunity for students and alumni to put the practice and preparation Career Services offered a week ago to the test. From making the appropriate eye contact and being able to give a firm handshake, Walker says even the tiniest details can make an impression on future employers. “Also, a big thing is having a powerful elevator speech, something the student can say in under 30 seconds to a potential employer that describes all of the need-to-know information about him or her: their name, major, aspirations and what they can offer the company,” said Walker. To learn more about the Career Fair and the employment opportunities offered at the event, contact Wright State’s Career Services at (937) 775-2556 or Career_Services@wright.edu.